Politicians who support these efforts use similar language. Senator and former Republican presidential candidate Marco Rubio, for example, declared the “simple truth that all human life is sacred” to be the most recent march’s inspiration. Yet neither Rubio nor the vast majority of marchers can credibly claim to have “pro-life” views. I do not think fetuses should be viewed the same way as people, but let’s imagine you disagree with me. Suppose, based on that disagreement, you believe an abortion kills an innocent person. You think enabling the death of innocent people is wrong, and you thus think abortion must be opposed in all circumstances. Isn’t that a “pro-life” view? Well, it depends. The logic of the ostensibly “pro-life” part of that reasoning is that, because X kills innocent people, and because killing innocent people is wrong, nobody should be able to choose X for any reason. Here’s the problem with that logic: “X” could be any number of things. Drone strikes kill innocent people. More generally, war always does. So does the death penalty. And many other policies, while less active and direct than drone strikes, war, and putting people to death, effectively kill people. Refugees are potentially given a death sentence when the countries to which they’re fleeing don’t let them in. Thousands of people die each year due to inadequate access to health care. And societies’ refusal to invest in substantial benefits for poor people both here and around the world leads to preventable deaths all the time. People who truly have a “pro-life” position, therefore, oppose all of these things. Those who are anti-war, anti-death penalty, pro-inclusive immigration, pro-universal health coverage, and pro-substantial benefits for the poor in addition to believing that fetuses are people and abortions are wrong may have a coherent, “pro-life” philosophy. Needless to say, that’s not a description of Rubio. He, like so many other anti-choice Republicans, opposes aborting fetuses but none of the preventable deaths mentioned above. That doesn’t mean Rubio wouldn’t offer a justification for his positions. He’d likely argue that drones, refugee bans, and military actions save more innocent lives than they sacrifice, that the death penalty is reserved for bad people who deserve it, and that providing health care and money for poor people slows economic growth, discourages work, and harms the very people such measures are intended to help. He’d be wrong about all of these things – the United States perpetrates far more violence than we prevent, there are innocent people on death row, and meeting the needs of poor people, which we have the resources to do, would be perfectly consistent with a strong economy and boost long-term economic mobility – but that’s not the point. The point is that Rubio does not allow the idea that “all human life is sacred” to guide his policy positions. Instead, he balances the sacrifice of human lives against other things he thinks are important and decides which he thinks matters more. In the realm of abortion, Rubio and others have decided that a fetus’s right to be born is more important than a woman’s right to make a personal, intimate decision about her body. Again, if you believe fetuses are people and that life starts at conception, that may be a defensible position. But if you also oppose raising taxes on rich people to provide health care and other basic needs to kids after they’re born, or if you support war, or the death penalty, your position definitely isn’t “pro-life.” If you contend that “human life is sacred” only when that belief deprives women of rights but not when it consigns innocent people to death or cuts a little bit more into your fortune, you don’t really believe it. What’s the Best Way to Deal with the Ku Klux Klan? On the recommendation of my friend and colleague Mike Mitchell, I recently listened to a fascinating podcast about Daryl Davis, an award-winning musician who is best known for his role in bringing down the Maryland chapter of the Ku Klux Klan – through his friendship with Klan members. In the podcast, Davis describes how, while playing country music in a bar in 1983, a White man approached him and expressed that he had never heard a Black man “play as well as Jerry Lee Lewis.” The two men struck up a conversation, during which Davis discovered that his counterpart was a card-carrying member of the KKK. Amazingly, Davis befriended the man. Nearly a decade later, he decided that he wanted to meet more KKK members. When experiencing overt forms of personal racism throughout his life, Davis had always wondered how people could harbor animosity towards him – without knowing him – just because of the color of his skin, and he believed that talking to members of the KKK could help him understand this phenomenon. Davis had his secretary set up an interview with Roger Kelly, the head of the Maryland KKK at the time, and, after a tense initial encounter, Davis became friends with Kelly as well. In the years thereafter, he developed relationships with several other high-ranking KKK members. During each of his encounters with them, Davis listened closely to what they had to say. He would challenge the Klansmen – when Kelly referenced the Bible during his initial interview, for example, Davis would pull out a copy of the Bible and ask Kelly to show him the relevant passages that ostensibly supported racism – but he remained polite and friendly while doing so. Over time, as the Klansmen got to know Davis, many of their prejudiced (and factually incorrect) beliefs about Black people began to erode. Eventually, some of the highest-ranking members in Maryland left the Klan and the organization itself dissolved. I have deep respect and awe for what Davis did and how much he accomplished. I would characterize Davis’s approach – politely disagreeing with Klansmen in order to break down stereotypes over time – as the “long game.” It’s about changing people’s minds and attitudes in the long run, and, if successful, pays huge dividends. At the same time, the long game is remarkably time-intensive. It’s also very risky – there’s no guarantee of eventual success, and in the short run, the Klan has relatively free reign to terrify and oppress a whole lot of people. An alternative approach – the “short game” – prioritizes protecting the oppressed over changing the mindsets of oppressors. 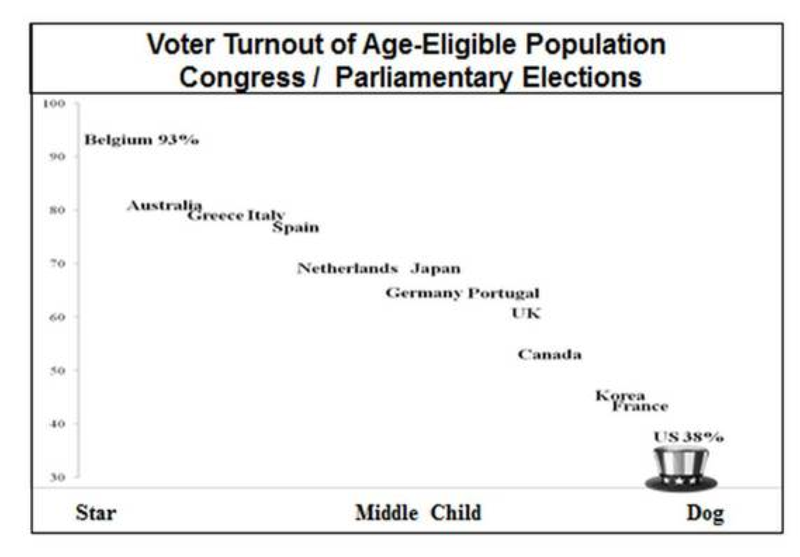 The short game is about checking people in power. That often means stating, in very clear terms, that certain viewpoints are unacceptable, and that there will be consequences for people who espouse them in public. There’s obviously some tension here between the short game and the long game, between laying down speech and policy that protect the oppressed right now and keeping the oppressors listening so they might in fact eventually change. I generally play the short game with a few elements of the long game incorporated – I love to engage with those with racist opinions, and I am happy to listen to what they have to say, but I differ from Davis in that I won’t say “we disagree” when I’m talking about a Klan member; instead, I’ll say that the Klan member is ethically and factually wrong, and that he shouldn’t be allowed to hold his intimidation rallies (I’ve long made a similar case when it comes to LGBT issues, too). I like to think that there is an appropriate balance to be struck between both tactics, but I struggle a lot with it. I want Klansmen to know (and society to acknowledge) that we don’t have mere differences of opinion – the Klan is definitively wrong about race and their incorrect and unethical viewpoint harms large numbers of people. At the same time, telling people their views are wrong and bigoted and preventing them from expressing them publicly is likely to cause them to tune out and feel more resentment, no matter how much I insist (genuinely) that I am interested in talking to them and hearing what they have to say. There’s definitely a difference between calling a viewpoint bigoted and calling a person bigoted, but part of me thinks there’s a lot of value in tying viewpoints to identity, especially in terms of the social pressure that can bring for people to curtail open forms of oppression. And I’m generally willing to accept some tuning out from oppressors, if it means that society will stop giving them a microphone and label racism and bigotry what it is. I tend to think that helping a few people change is less important than making sure they don’t harm anyone, and that, absent an amplifier for oppressors’ views, reason and compassion will become much more prevalent in the next generation. All of that said, I recognize that my White privilege allows me to advocate for this approach with little fear of repercussion, whereas Davis would very likely be labeled an Angry Black person if he were to adopt my strategy today (and if he tried it with Roger Kelly, he almost certainly would have ended up dead). I question whether my preferred tactic for confronting racism is most appropriate in large part because it’s available to me only as part of a menu of relatively consequence-free options that may be unavailable to my Black friends. In short, I would be very interested in hearing Davis’ and others’ thoughts on my tendencies in this space, and on whether or not there’s a better way to reconcile the tension between the pursuit of short-run protection for the oppressed and long-run change in the oppressors. 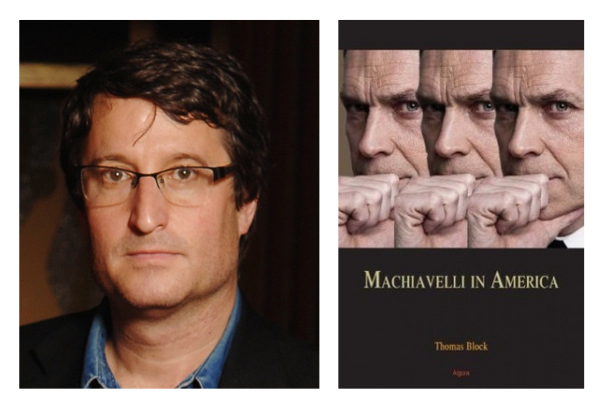 Tom Block is an author, playwright and artist, whose work spans more than two decades. In this blog post, Tom introduces us to his political antidote to our Machiavellian political sphere. Adapted from his book, Machiavelli in America, this piece is part of Tom’s greater exploration of how to bring spiritual and even mystical values to bear on contemporary society. His work is collected under a theory he calls “Prophetic Activism,” a model of using art, thought and other means to infiltrate (rather than simply oppose) the power centers of business and politics. 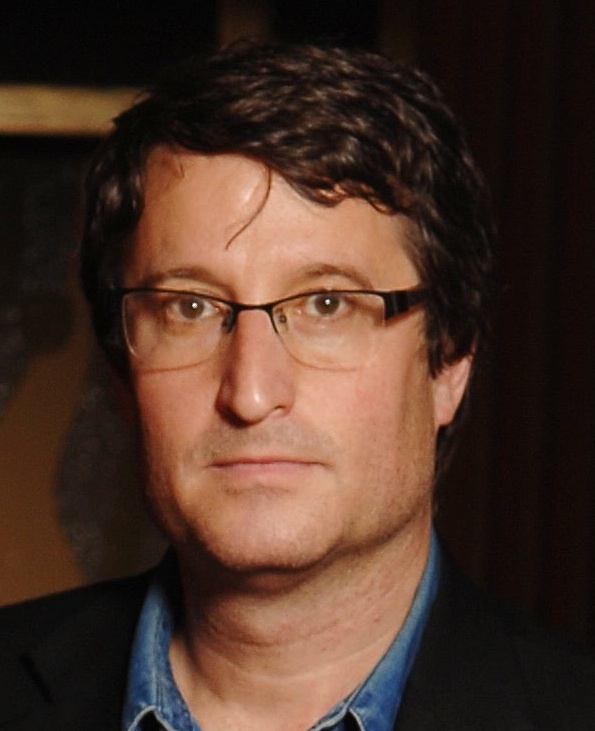 For more information about Tom’s work, please visit his website. Nowadays, the Machiavellian notion that political arrangements may not be judged by any objective standards of right and wrong, that there is neither any natural or any divine law, but only the law of will, of success and failure, is almost unchallenged (p. xvi). Many people are familiar with the controversial thinking of the Renaissance political philosopher Niccolò Machiavelli (d. 1527). His influence has been so widespread that the word “Machiavellian” has been incorporated into our language as a pejorative, defining a person who is cunning, duplicitous and operates in bad faith. The foundation of Machiavelli’s political ideology is straightforward: everyone in society is selfish, acting primarily for personal gain. And for a politician to succeed in mastering this world, she has to either manipulate or frighten people into believing that their interests ally most closely with her own. Machiavelli’s program concentrates on subjugation and mastery. He does not concern himself with the common good, democracy or human rights. For Machiavelli, the concepts of moral philosophers from Moses to the Sufis and the religions within which they operate are certainly important. But only because these religious systems provide a fraudulent tool for the relentless, morally unhinged pursuit of power. In terms of their direct relation to political reality, however, he considers them as meaningless as music. I come to the conclusion that, men loving according to their own will and fearing according to that of the prince, a wise prince should establish himself on that which is in his own control and not in that of others (p. 82). The great majority of humans is satisfied with appearances, as though they were realities, and is often more influenced by the things that seem than by those that are (p. 182). It is through inspiring fear in the citizenry, as well as using fraud as a tool to appear to be what the people want (i.e., safe, religious, moral, “like” them etc.) that political victory can most easily be won. A wise mind will never censure anyone for having employed any extraordinary means for the purpose of establishing a kingdom or constituting a republic . . . when the result is good, it will always absolve him from blame (p. 139). Machiavellian inspiration is not hard to discern, either throughout American history or even in our most recent political season. A brief study of George W. Bush’s (43rd President of the United States) manner of attaining a very dubious electoral victory, and then his perverse political use of the terrorist attacks of 9/11/2001 (on New York’s World Trade Center and other sites) would suffice. But for our purposes, it is important to mention that George W. Bush was acting in a time-honored American Machiavellian tradition. Neo-Conservative thinker Michael Ledeen (b. 1941) noted the similarities between the beginnings of America and the Florentine’s ideals: “There is much in Machiavelli that sounds like the American Founding Fathers…Machiavelli’s notion of the good state calls to mind The Federalist Papers” (p. 109). Ledeen continued on to reference specific Machiavellian influence on James Madison (fourth President of the United States), Alexander Hamilton (first United States Secretary of the Treasury) and Benjamin Franklin (Founding Father and so-called “First American”). The Florentine’s inspiration can also be found on the thinking of George Washington (first President of the United States); Thomas Jefferson, (principal author of the Declaration of Independence) and John Adams (America’s first Vice President, as well as the second President of the United States). All of this has been outlined in more depth in my book. The reverberations of the long-ago Florentine political philosopher can clearly be ascertained in the most recent electoral campaigns, which often are based in fear, character assassination and moral fraud. As many observers predicted, the McConnell strategy was to bring Grimes’ popularity down. She has been bombarded by negative attacks over the summer by McConnell’s campaign and super PACs. The reality of American politics turns away from the moral intentions of our Declaration of Independence and Constitution and toward a power-driven oligarchy, ruled over by the most pernicious, negative and fraudulent. Machiavelli has been a theme in American conservative political discussion since the 1940s. It is likely that the use of Machiavelli has contributed to the combative mentality that characterized American Cold War politics, the belligerency of American conservatism and the take-no-prisoners tactics and language employed against liberalism and the Democrats (p. 168). In my book, I outline many specific manners in which Machiavelli not only influenced our Founding Fathers, but also can still be felt in the legislative, executive and even judicial branches of government, including the overwhelming power of money, the efficacy of character assassinations and the use of war-like language to the utilization of religious and moral fraud and war itself, all as immoral political tools. Regardless of what we might wish, think or work for, it is the Machiavellian dictates of power politics which are accepted as “politics as usual,” while all other potential moral methods of political interaction are simply shunted to the side as the strategy of losers. And time and again, the results of political elections confirm the view that Machiavelli is for winners. Although this dynamic is well known and even remarked upon, we (as a society) haven’t developed effective responses to Machiavelli, specific manners of combatting this pernicious dynamic. What I offer in my book, and will summarize here, is one manner of attempting to combat this social cancer. And one which takes into account our zeitgeist, from the deeply religious nature of so much of America’s public life, to the unwillingness of American journalists to base their reporting on the truth, opting instead for some mushy middle between the positions of the two major parties, which they define as “objective.” This lack of moral clarity in the press corps only allows fraudulent political actors more leeway in creating their own alternate reality, a vile combination of fraud, character assassination and amoral pandering. Though at least one administrator of this blog might disagree with me, I feel strongly that God and religion must be taken into account when considering a palliative to the shared social illness exhibited in our public square. Activist responses to social illnesses must take into account the reality of that society; and offer familiar (i.e., religiously-based for Americans) manners of infiltrating and changing it – instead of simply standing outside of the metaphorical walls to the city and lobbing well-meaning and ineffectual ideas toward a population that couldn’t care less. Ha, ha, ha! The political participants on both sides of the aisle would never accept common sense remedies such as this one. It would too easily and clearly unmask the whole pernicious system. Lie detector tests are for criminals! Not for politicians, they would assure. And we certainly can’t rely on the press to offer us a reportage of current politics and events based on truth (instead of some bizarre combination of “objectivity,” generally held opinion and polling data – which itself only represents the desires of the most powerful propagandistic machine). Honest discourse and unimpeded knowledge is virtually impossible to come by in the American political panorama. For this reason, I propose that clearly stated information itself represents the greatest potential tool supporting genuine democracy. In a country where voter suppression, lying, cheating, stealing and all manner of fraud are accepted as “politics as usual,” the ability to come by clear and concise information on any issue is virtually impossible. The Moral Ombudsman would operate within the parameters of 21st-century Washington D.C., acknowledging the manner in which power is won and imposed. Specifically, this is the call for the creation of a non-profit organization of the same name: “The Moral Ombudsman,” to develop and insert a moral lodestar into politics. The Moral Ombudsman would bring together a board of recognized religious and social leaders to form a non-governmental organization to provide moral oversight of our lawmakers, as well as the laws that they make. This collective would be constituted of leaders from the following religious and spiritual groups, representing the breadth of faith and secular communities in the United States: Christianity (two each from Baptist, Pentecostal, Lutheran, Presbyterians, Methodist, Anglican, Catholic and Eastern Orthodox); Judaism (one each from Reformed, Conservative and Orthodox); Muslim (one each from Sunni, Shi’a and Sufi); Buddhism, Sikhism, Hindu, Mormon; Unitarian, Secular Humanist and Atheist. Other potential board members might include an academic leader, an agreed upon politician (preferably at the end of his public career, and not at the beginning), a social theorist or perhaps lay leader who would add perspective to the conversation. The final constitution of the board would represent the vast majority of American citizens. It would also acknowledge the Christian heritage of our nation by weighting the board in that direction. The board would first be charged with developing a social and political moral code that would be agreed upon by all members of the board. Although at first blush, this step clearly seems to present a potentially insurmountable obstacle, it is not as difficult as it might appear. At the core, virtually all religions are in accord. There are moral values shared by all creeds, which inform the hearts of every sacred path. In this response to Machiavelli, the common good will take into account such things as the obligation of those who have the means to aid those who do not; the right to adequate health care access to for every citizen (hardly revolutionary, as thirty-two of the thirty-three developed nations have universal health care, with the United States being the lone exception); adequate shelter, a necessary amount of nutritious food, free education, freedom of religion and association and freedom from racist or ethnically deleterious laws and treatment. Each religion’s scriptures provides many different readings, from the suppression and slaughter of the “other;” veiling of women; polygamous and tribal laws to readings that emphasize peace, respect and open-mindedness. Put bluntly, George W. Bush could find plenty in the Scriptures to justify his views, as could Martin Luther King Jr. Leaders from the various religious creeds would be sought who believed in the opening and loving aspects of their creeds, not the close-minded, “us” vs. “them” manner of politicizing religion. They would conceive of theirs as a valid path, and not the single road to spiritual grace. They would be leaders whose views shared much with the contemporary zeitgeist in respecting the plurality of ethnic, social and cultural diversity and the worth of individuals (instead of holding that the religious system is more important than the rights of its constituent members). The Moral Ombudsman would reach beyond social, economic and political barriers, speaking in the best interests of all Americans, all the time. The Moral Ombudsman would be immune to fluctuations in the stock market, monetary reward, poll numbers or television ratings. Issuing its decisions in policy papers, op-ed articles, newsletters, scorecards on the votes of members of congress, governors and the president and other like manners, this non-profit watchdog group would finally offer a true moral center from which to judge the legislation and actions of our elected princes. Once the moral structure was set into place with the creation of a specific set of political virtues, the work of the organization would be to judge both legislators and legislation by its precepts. Each law coming up for a vote in Congress would be compared to the moral principles agreed upon by the Board. A grade would be issued, with a zero representing a completely immoral law (such as raising taxes on the poor so that the rich might have a lower tax burden), to a 100% (universal health care, for instance). There would be a written release issued, as well as a rating. Each legislator would have his votes analyzed, and would receive a sum-total number score for his moral centeredness. This method is modeled on the scores issued by NGO groups from the National Rifle Association to the Nature Conservancy. In the end, difficult though it might be, a moral middle would be carved out of the amorphous and amoral public and political square. Finally, some manner of shared values would emerge that each of us, in our heart of hearts, might agree upon. Is this solution easy? Absolutely not. Is it fraught with potential problems? But we are left with no choice but to try. During the 2003-2004 school year, my chemistry teacher told my class that global warming wasn’t occurring. I believed her. When I attended New Jersey’s Governor’s School of International Studies in the summer of 2005, a professor told me the opposite – the evidence for global warming, and for the human contribution to it, was virtually incontrovertible. Confused about what to think, I began to research the issue. I also reached out to some of my other former teachers to ask for their input. Three things became immediately clear. First, most popular articles about global warming contained more empty rhetoric than useful information. The mainstream media, as it far too frequently does, focused not on the truth but on grandstanding and a false sense of balance. Second, I didn’t know enough climate science to look through a given study’s results and determine their legitimacy. Third, I didn’t have to – a different approach could tell me everything I needed to know about each study’s likely veracity. Global warming research falls into two categories: research by legitimate scientists and “research” funded by big energy interests. Legitimate scientists, who have no economic incentive to lie, conclude that global warming is a manmade crisis deserving our immediate action. The few studies that suggest otherwise are normally sponsored by organizations like Exxon and the American Petroleum Institute, interest groups with billions of dollars invested in the activity responsible for global warming. As with global warming, knowledge of the individual and organizational incentives behind opposing “sides” of any debate provides us with critical information. This “political lens,” though not completely foolproof, reminds us that certain claims deserve a larger dose of skepticism than others. The agendas behind a movement are especially important to consider when we lack in-depth knowledge of a particular issue. In education policy debates, “reformers” far too often selectively and inaccurately apply the political lens or dismiss its importance. That dynamic surfaced after Stephen Colbert interviewed former CNN anchor Campbell Brown on July 31. Brown’s organization, Partnership for Educational Justice, had filed Wright v. New York three days before the interview. Wright, modeled after Vergara v. California, challenges several aspects of teacher employment law. A small group of teachers, parents, and grassroots organizers showed up to protest Brown’s appearance on the show. Colbert, responding to the protesters and the Twitter hashtag #questions4campbell, asked Brown about her organization’s funding sources. Brown refused to disclose her donors. Amidst the criticism that followed, various stakeholders have rushed to Brown’s defense. 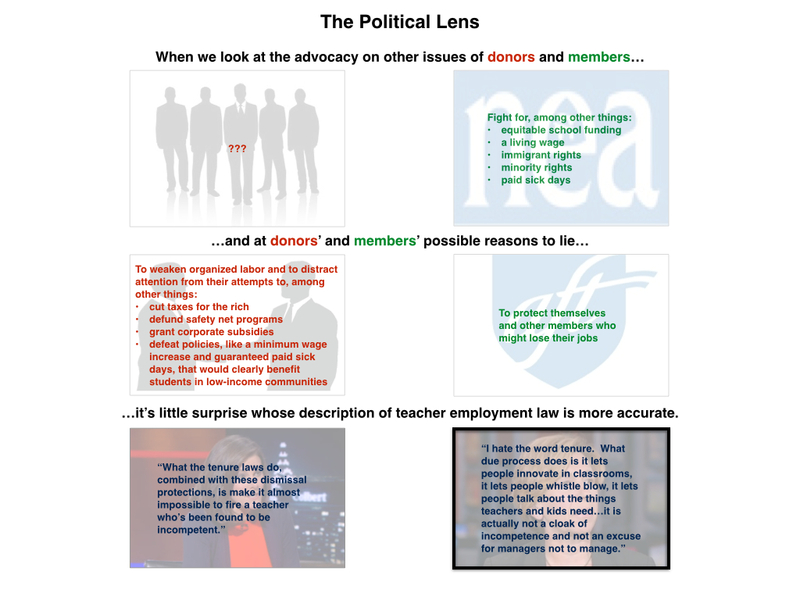 They continue to argue that a focus on Brown’s donors and political affiliations is a “desperate effort to distract from the real conversation” about teacher employment law. The truth of the matter, however, is that educators would love to focus on substantive conversations about teacher employment law. Teacher “tenure” and dismissal and layoff procedures, though they are intended to protect both student and teacher access to a positive, productive educational experience, don’t always work as intended. Unions recognize this problem and recommend legislative improvements that simultaneously address issues with the execution of the laws and preserve their important components. We also frequently discuss the laws on their merits. Additionally, student advocates would love to see reformers, unions, and legislators engaged in substantive conversations about how to unite behind and fight for causes that matter considerably more for the lives of low-income students: in-school causes like funding equity and improved teacher support and out-of-school causes like the living wage and immigrant rights. Unfortunately, pro-Wright propaganda, featured much more prominently in the mainstream media than legitimate arguments for the defense, often drowns out these “real conversations.” No teacher has a job for life, competent school districts can and do dismiss bad teachers, and there is absolutely no evidence that teacher employment law causes inequities between low-income and high-income schools***, yet relatively large swaths of the American public have bought Brown’s misleading narrative and harbor severe misconceptions about the statutes and their effects. Brown isn’t leading her crusade with a rigorous analysis of the facts and sound logical argument; instead, she “addresses” the lawsuit’s substantive critiques by ignoring inconvenient statistics and logic and implying that disagreement indicates a disregard for the well-being of children. It’s hard for the public to understand the nuances of education law and research when Wright supporters prominently and erroneously equate opposition to the lawsuit with the defense of horrible teachers. Thus while education law and research is arguably less complicated than the science behind global warming, the political lens is equally important to consider in this debate. It’s theoretically possible that the unions who defend teacher employment law do so to protect teachers who call students names and sleep in class. And it’s theoretically possible that Campbell Brown and her unnamed donors care more about the lives of low-income kids than do the unionized teachers who work with them every day. It’s also theoretically possible that Exxon produces more honest research about global warming than does the entire scientific community. But these theoretical possibilities are all extremely unlikely. Instead, it’s significantly more likely that Campbell Brown’s donors, like the people who funded Vergara v. California, actively exacerbate economic inequality. That Wright v. New York and Vergara conveniently allow them to undermine organized labor and distract us from the ways their business and political activities harm the families of the very same low-income students they purport to help. That teachers in unions care deeply about delivering an excellent education to their students, and that their opposition to the lawsuit stems from its negative narrative, erroneous claims and premises, and failure to provide solutions to the actual causes of teacher quality issues. In other words, looking through our political lens reminds us that there are literally billions more “adult interests” in support of Wright v. New York than in its defense. Educators must continue to clarify facts about teacher employment law and support responsible reforms. Most proponents of challenges to the statutes are well-intentioned, and a focus on agendas alone would not do the issues justice. It is also entirely legitimate, however, to call attention to the profit and political motives behind lawsuits like Wright and Vergara. Knowledge of donors and allies helps us understand why, when unions and Campbell Brown present conflicting information about the law’s intent and effects, Campbell Brown’s claims warrant significantly more suspicion. ***While the plaintiffs in Wright, unlike those in Vergara, do not erroneously contend in their complaint that the laws cause inequities between low- and high-income schools, the idea that low-income students are disproportionately impacted by bad teachers was mentioned by Brown in her appearance on The Colbert Report and still surfaces in discussions of the lawsuit. Update: A version of this post appeared on The Huffington Post on October 2.